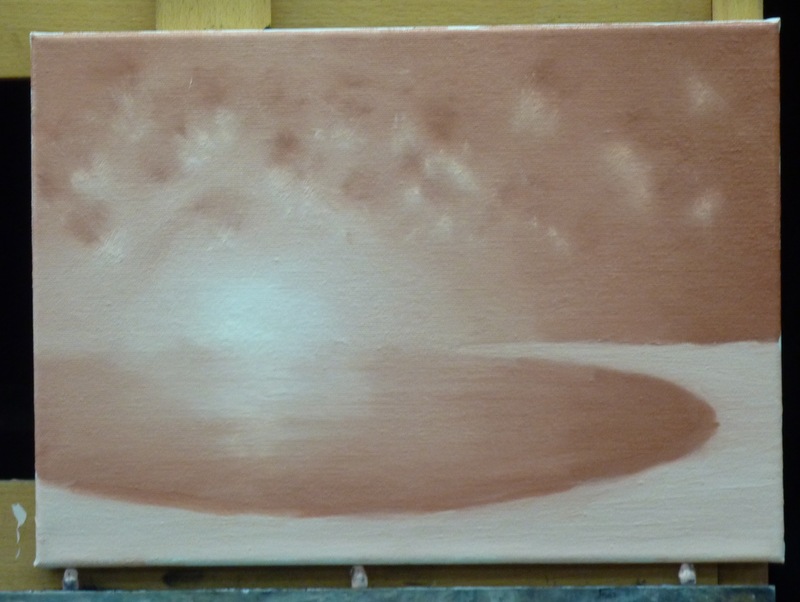 Today I attended an Introduction to Oil Painting workshop at Real Art Academy (Bournemouth). This was a Groupon Deal I bought for a friend and I to attend (sadly my friend was poorly so I went alone). I was in a class with 6 other people. The artist who taught us (and who runs the academy) is Martin Close – he was very passionate about his subject and as well as helping us all make the painting below he talked about purchasing the correct materials, canvases, oils, brushes etc. He also told us about the Atelier method (used by the old Masters) that he uses to teach his students (one for the wishlist). Martin, by his own admission, likes to add the letter y on to lots of words so we set about dabbying, fannying (!) and so on. 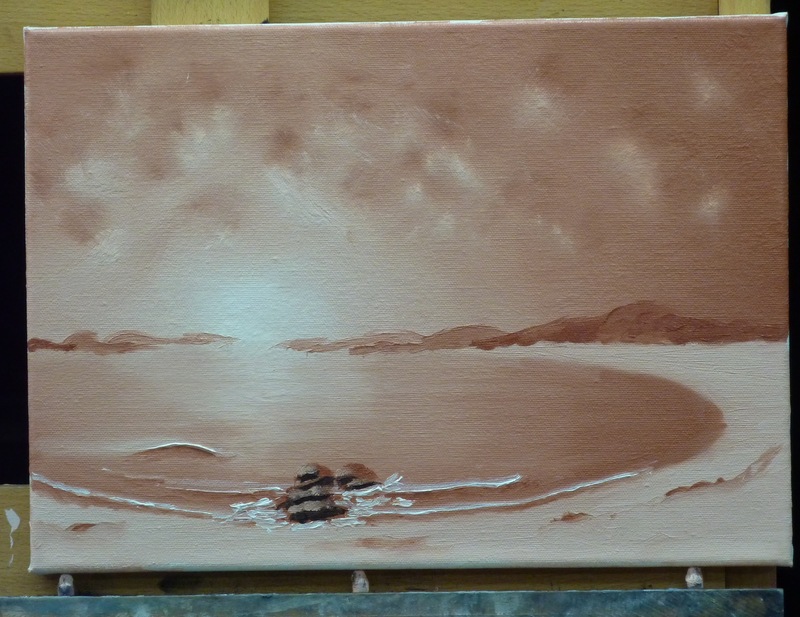 The following 10 pictures show the stages (I’ve summarised a few) to make a seascape in one colour (7 shades – one of which was titanium white). Martin prepared the canvases by drawing the horizon line at 2/5ths (something to do with the Fibonacci sequence) up the canvas and drew on the ellipse for the sea. We started our own impressions on the page by painting (in Titanium White) an ice-cream cone about a third of the way in, with the ice-cream above the horizon line and the cone extending down to the bottom of the ellipse. Then came time to add the afros (above horizon) and the earrings (below)!! Sweeping across the cone as we go. 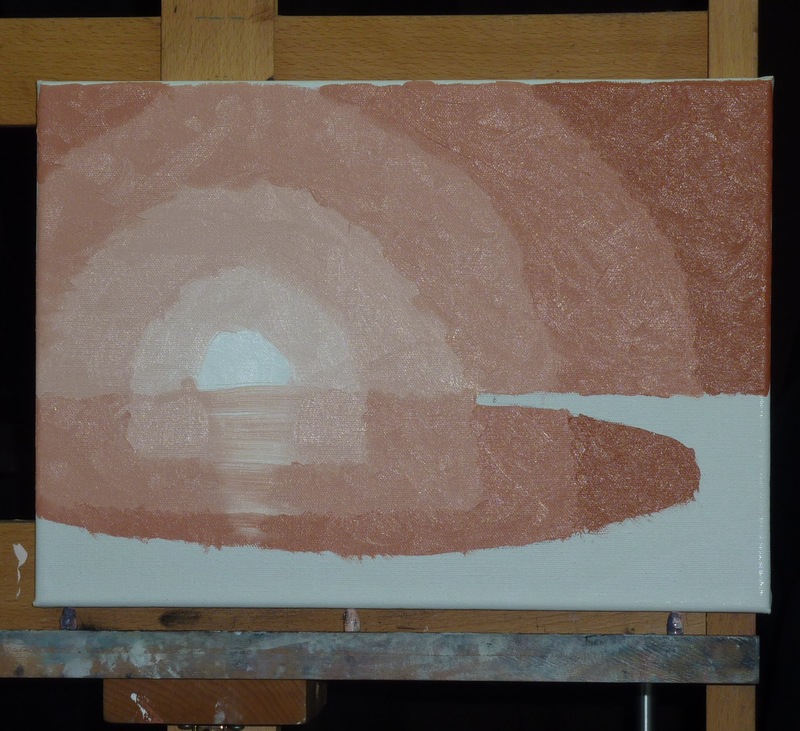 We carried on adding the semi circles above and blocks below until the top of the canvas and the ellipse was covered. I have to admit to wondering how our fros were going to end up like the examples on the wall. But, Martin had asked us to trust and put our faith in him so we did. 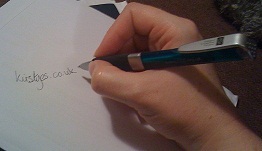 Then came time to circle to get rid of the lines. Always working from light to dark. (There was lots of use of kitchen paper to wipe the brushes and the paint was squeezed onto ceramic which worked well). See – no lines. Love the effect of the reflection of the sun in the water. We used a technique called drunky monkey to add in the clouds. As well as ‘kissing’ with a fan brush. I think my ‘drunky monkey’ needs work. Then came the sand – using a side to side motion. This was nice and easy as we just had to fill in the blank canvas. 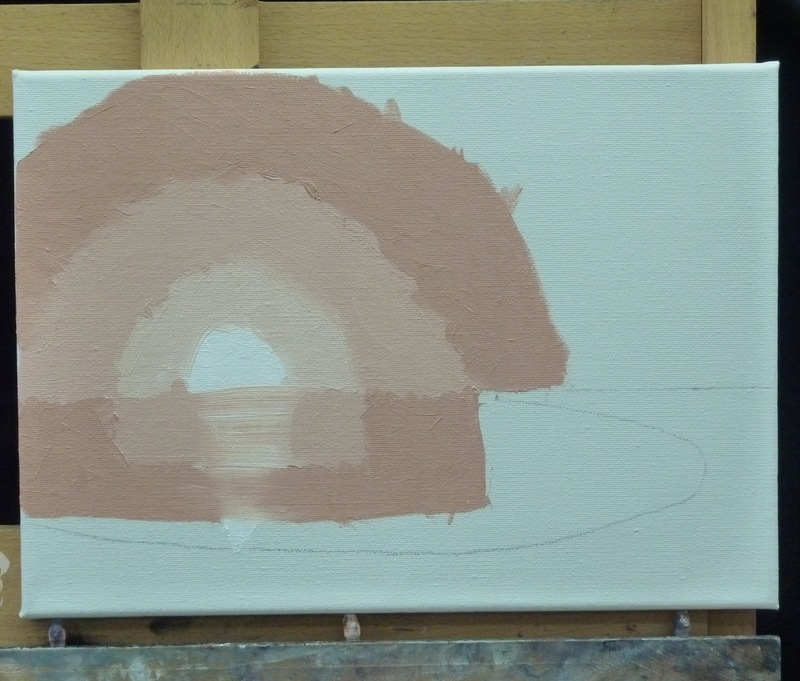 Then we added in headland – moving out and under with the darker colours. Then came the trickiest bit for me. Adding in the foam required loading only half the brush and sweeping it along. Note my attempt here. And Martin’s assistance to make the curvy wave a bit cleaner (thanks Martin). 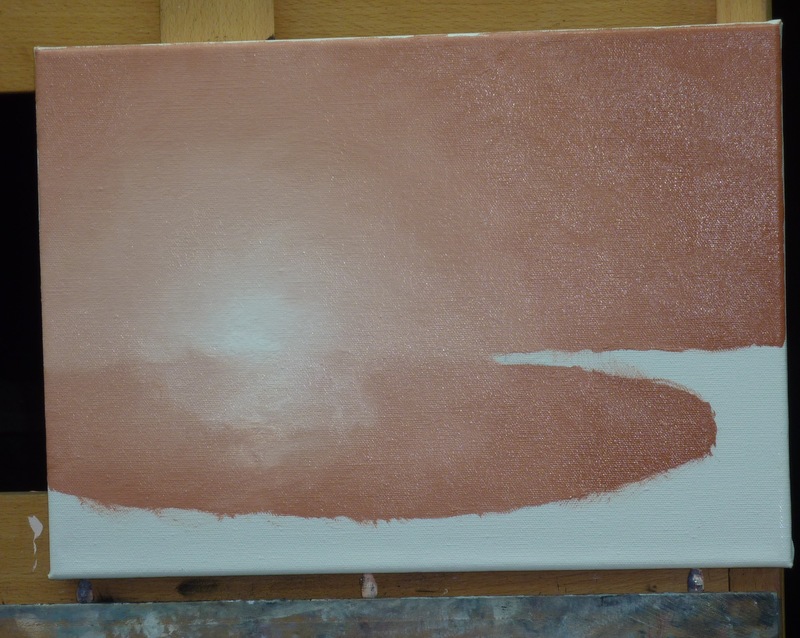 We then used some darker colour underneath and blending to create shadow. 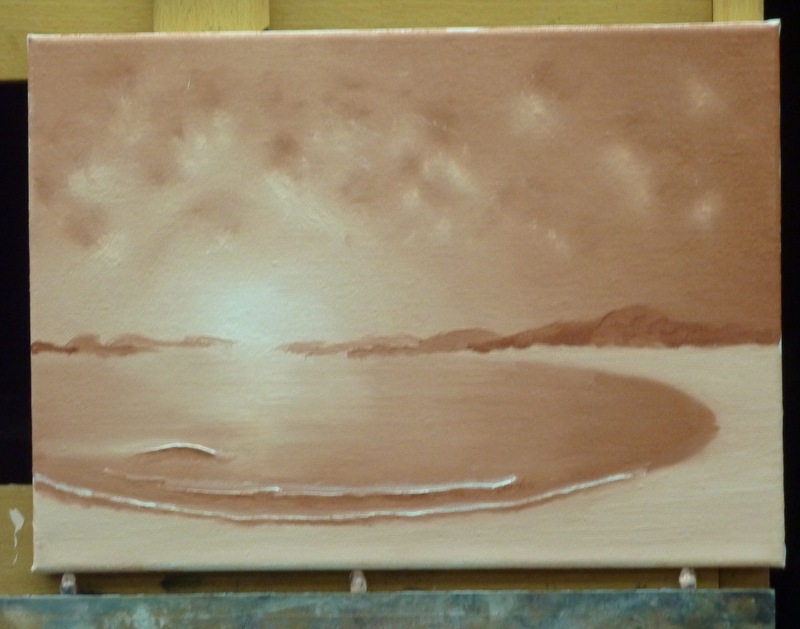 Finally another trickier part, the addition of rocks and then some ‘sand dunes’. From a distance they look okay but think they could have been better. 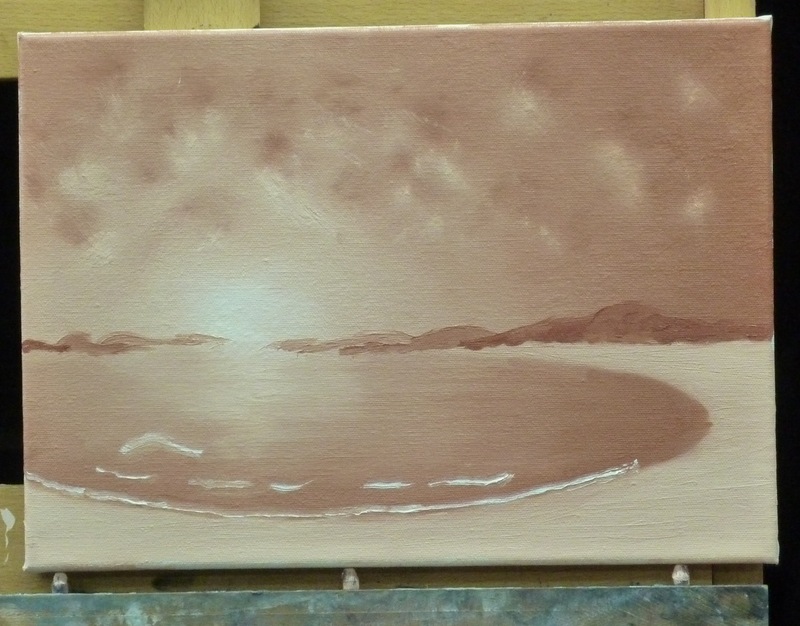 But hey presto – for my first oil painting I’m very pleased – this was clearly down to the instruction. Martin has had children as young as 5 produce these so go learn from the Master. Martin explains, demonstrates and then you have a go – this is the best way to learn I think. Yes you can see the stages in the pictures but you learn so much from being there, and seeing everyone else’s progress too. Oils are much nicer than acrylics but until I have more time to dedicate to learning something like this I’m going to have to make do. They really don’t behave the same way at all though – acrylics dry far too quick to work with in this way. Now after getting it home safely I have to wait about 10 days for it to dry and then ask Dad to come and put a nail up for it to go on the wall. Posted on March 9, 2013, in Kirsty rambles on about life, the universe, tv, and everything!, Reviews and tagged Atelier, Groupon, Martin Close, Oils, painting, Real Art Academy. Bookmark the permalink. 2 Comments. Thanks so much Claire. I enjoyed it.